A Star Wars spin-off film will tell the back story of space smuggler Han Solo, Disney has announced. The new movie is to be directed by Christopher Miller and Phil Lord, the men behind the hugely successful Lego movie. The charismatic criminal turned Rebellion hero returns in Star Wars' next instalment: The Force Awakens this Christmas. Actor Harrison Ford last played Solo in 1983's Return of the Jedi. No details or casting have been yet been announced but the script will be written by father and son team Lawrence and Jon Kasdan. The senior Kasdan co-wrote The Empire Strikes Back, Return of the Jedi and The Force Awakens, the latter with director JJ Abrams. 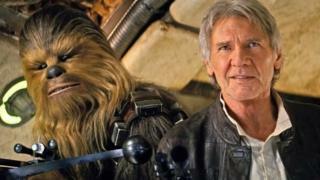 There was a huge excitement in the fan community earlier this year when an extended trailer for the new film featured a brief appearance of Solo and his Millennium Falcon co-pilot Chewbacca, appearing to be on the deck of his famous spaceship, uttering the words, "Chewie, we're home..."
The untitled Han Solo project is scheduled to be released on 25 May 2018. It follows the first stand-alone Star Wars anthology film Rogue One, which is due next year. Which actors are in the running to play Han? The Breaking Bad star has sent the rumour mill into overdrive after the Star Wars official Twitter account started following him. The 35-year-old Instagrammed a screenshot of the moment, captioning that his "dreams are coming true." Unsurprisingly he is the favourite for the role according to bookmakers. The 25-year-old Brit and husband of Fifty Shades of Grey director Sam Taylor-Johnson most recently starred in the Marvel blockbuster Avengers: Age of Ultron. No stranger to movie franchises, the Hunger Games actor is Buzzfeed's number one choice. The Jurassic World actor's star has rocketed after Guardians of the Galaxy and Jurassic World. Rumoured to be the next star of Indiana Jones, could the Harrison Ford likeness make him a popular candidate? Best known for his portrayal as the Winklevoss twins in 2010's The Social Network and the title for in 2013's The Lone Ranger, this role could propel Hammer into a superstar stratosphere. The Aussie actor is known for his action roles, currently starring as Marvel's Thor and appearing in the Avengers movie franchise. He also appeared briefly in JJ Abrams' Star Trek reboot, as Captain Kirk's father. Angelina Jolie's a fan of this Brit, having cast him in her most recent directorial project, Unbroken. Last year's winner of the Bafta Rising Star Award, landing the part of Han would be the proof of the pudding. Known for his vocal roles in High School Musical and Hairspray, the role of Han would mark a change of direction for the 27-year-old. Big action movies have become second nature to this 25-year-old having starred in the X-Men franchise as Hank McCoy as well as in Mad Max. He's an outside shot at the role though according to bookmakers.